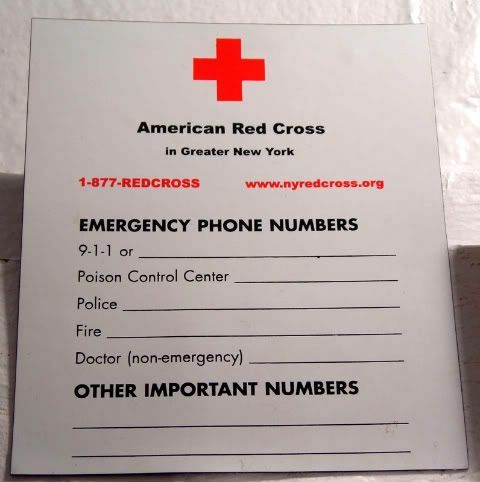 I picked up this Red Cross magnet many years ago, in the post-September 11th haze of preparedness. Yes. I know I didn't fill out the rest of the numbers. Don't focus on that. It's early days yet...and it's going to be a marathon of lending a helping hand to the devastated country of Haiti. Text "Haiti" to 90999 to donate. 100% of your $10 donation passes thru to @RedCross for Haiti relief. Your cell carrier keeps nothing. And? As of 5:35pm or so, Mashable confirmed that more than $800,000 was raised just from the txting! Well, there's something to be said for this mobile age, after all. Now that the immediate crisis has moved into the mid-term "OMG how do they start to recover" phase, now can I poke you to get you to write those emergency numbers down? Maybe not on the magnet, but somewhere obvious. Awww, in case of emergency, I'm hoping I'd just leave my magnets. Although, my building sent around a fire hazard notice saying that we've had three building fires since October. Freaked. Me. Out! Especially since I was barely here!